The Beaver Lake Volunteer Program began in April, 2014 as a partnership between Ozarks Water Watch and Beaver Water District to collect monitoring data on Beaver Lake. 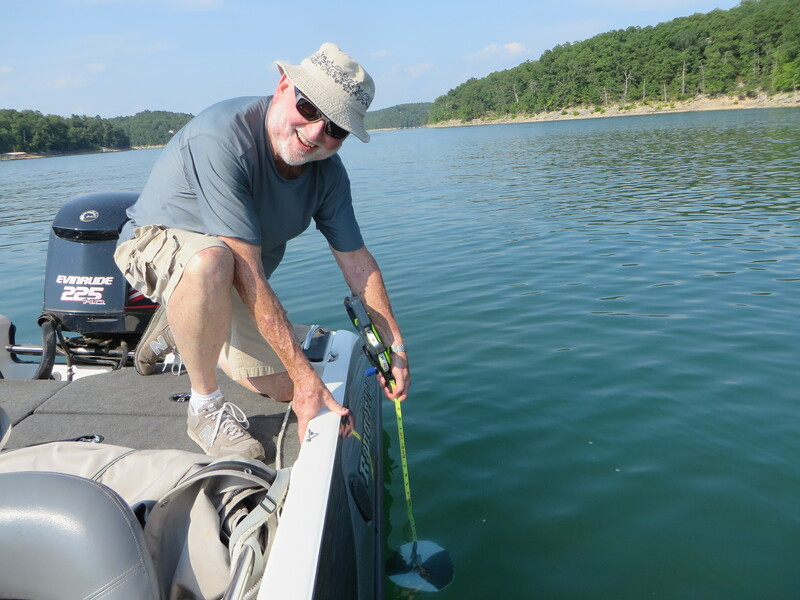 The program supplements the data collected during the annual Secchi Day on Beaver Lake and other monitoring programs in the Beaver Lake Watershed. 1. To describe water quality in all participating lakes in terms of trophic status. 2. To monitor for changes in water quality over time. 3. To educate the public about lake ecology and water quality issues. Making field observations on your lake and recording them on a Data Sheet. Collecting and processing lake water samples and recording information on the Data Sheet. Proper storage of samples and equipment. Transfer of field data and samples to program staff members for analysis at our laboratory. We ask that you make field observations and take samples eight times in all, April through September, spacing them every three weeks. We will provide you the sampling schedule during training and each year at the beginning of the sample season. You will also collect lake water samples when you make your field observations. In your home laboratory, most likely in your kitchen, you will process these water samples for later analysis at the Beaver Water District lab in Lowell. Setting up a nutrient bottle for analysis of nitrogen and phosphorus. Filtering lake water for chlorophyll analysis. Filtering lake water for total suspended solids analysis (on some lakes). Proper storage of samples will involve freezing them until they are picked up by BLVP staff. Pick-ups will occur during the middle of the summer and at the end of the season and are coordinated by program coordinator, Angela Danovi. Opportunities are still available for volunteers to participate in Beaver Lake Monitoring. In 2015, there will also be volunteer opportunities for monitoring in the smaller lakes within the Beaver Lake Watershed. These lakes will be accessible by kayak, canoe, or other manual powered craft. Anyone interested in participating in the Beaver Lake Volunteer Monitoring program can contact Angela Danovi at adanovi@ozarkswaterwatch.org or at 479.295.7717.